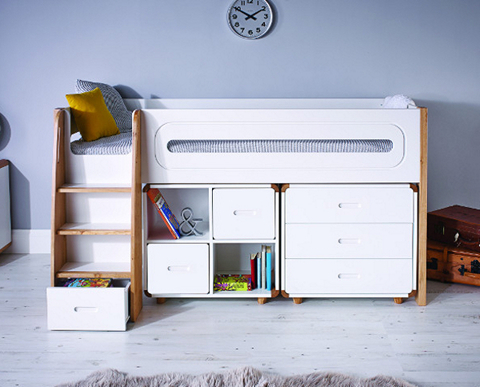 It is accompanied by Stompas Curve three drawer chest and cube storage unit which both offer a practical place to store books, toys and clothing. The chest and storage cube can easily be stored beneath the midsleeper, and pulled out when needed. The chest features three drawers with inset handles and smooth metal runners, whilst the cube provides four compartments (two with white lacquered hinged doors) which enable you to quickly stash and hide away clutter. 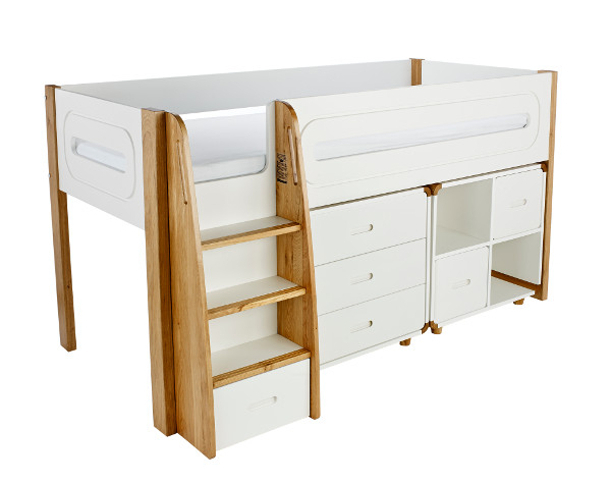 Includes Curve Midsleeper with 3 Drw Chest and Cube Unit with a pair of white lacquered doors. Curve 3 Drawer Chest Dimensions- H680xW750xD400mm.